Please go to http://oufholo.net and then come back here and post your opinion. A screenshot of what you see would also help me along with what browser you use. I love it! 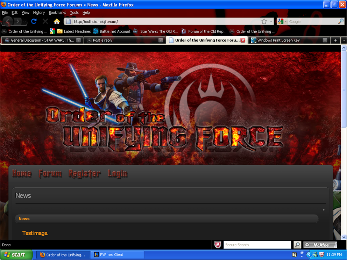 I love the background and the title/header with the smuggler and sentinel! I can't wait to go back to that site! Bladen wrote: I love it! I love the background and the title/header with the smuggler and sentinel! I can't wait to go back to that site! The entire forum is there but I have not cleaned up user groups or permissions since importing users and posts. All that is easily fixed. Right now I am working on the navigation buttons. The PM ones are proving difficult to code. I like the base of it, but I don't know about the background. I personally love the background, but it just doesn't seem to hint "unifying force"
but meh, I might just need to look at it a bit more. Why does it not make you think 'unifying force'? (and then I have a pre-prepared reply to what I think you are going to say lol). Were you expecting me to say "because its not green"? I know I originally based OUF fully on green because at the time to me green = nature and OUF = the natural (full) power of the force. So, consider the various ways that nature is powerful. Yes the power of regrowth in the plants and animals is mighty, but more obvious power can be found in the oceans, waves for example are impressively powerful. Now consider the power of a volcano, another one of the awesome powers nature possesses. I think that looks fricken badass man. RED AND EXPLOSIONS!!!! BANNGGG BWOOOSSHHH BAAWWWW!!! Makes me wanna shoot sith in the head and stab rancors with a pencil. Thanks for the SS and browser info Jas, from the SS it is appearing as intended, though the newspage text looks bigger. I don't think that's a deal-breaker though. Login details from the old OUFHolo.net site should work too btw. I also see the same black line/box that I get across the top of the page, I will have to try figure out why that is there and remove it. Looking great keep up the good work! 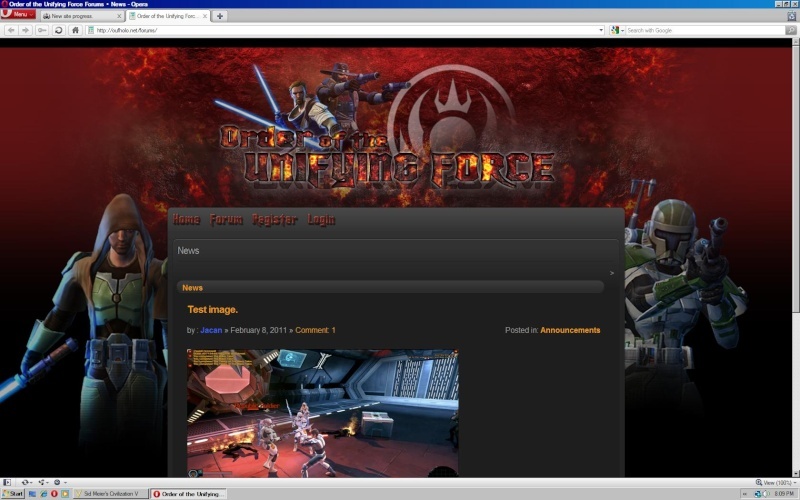 I found a great site you can pull some code from for the forum layout if you like, just view the code; copy and past to tinker around with stuff... http://www.trinityguild.org/ they have a couple tools I like to see like the Recruiting tool and some of the layout for links and such. by the way, this is the size whenever I use firefox, it doesnt seem to get all of it. By the way, now that I look at the site, I end up really liking it. The background is designed atm to fill the space either side of the forum for those with huge screen resolutions, if you don't get all of the background don't worry as long as you get all of the forum itself. I like the design and layout of the site and everything seems to be functional for me. Same here I have had a little paly and all seems fgood to me. I prefer the greens that this site uses as it seems more natural to me. Red/Orange brings up images of anger and violence but thats just my opinion. Colour and images can be reasonably easily changed in the future if we decide to one day. I hope you didnt think I was having a pop at the new site just expressing my opinion! Once everything is sorted over there I will start making myself busy on SWTOR again and try to do a recruitment drive again. The colors are an attempt at reclamation. As the "Unifying Force" we (in a RP sense) use all forms of force power and the traditional blue of the Jedi and red of the Sith mean nothing to us. By using red we are saying that we are not bound by the norms, everything is open to us and nothing is closed. We expected there to be a few people questioning the color and its important that the majority likes and feels comfortable with the choices made. Here is my screen shot. I have Windows 7 and Firefox. Still can not log in. Every time I try it gives me the message "you have exceed the maximum number of allowed login attempts... bla bla bla" and the CAPTHACA is all squished and not visible; even after I tab through the fields its still does not let me log in. Try it again its changed since that shot was taken. Jacan Na'al wrote: What browser Illian? Edit: its fine in IE now and Firefox appears ok but all my other browsers I use normally can not display it... Oh and in IE the main area is left justified now not centered like it was before, don't know why. I also tried to log in with my credentials from this site but I assume I still need to register >.< so I will do that now. The left justified is known.